Sheikh Hamad bin Khalifa bin Hamad bin Abdullah bin Jassim bin Mohammed Al Thani is a member of the ruling Al Thani Qatari royal family. He was the ruling Emir of Qatar from 1995 to 2013. The Qatari government now refers to him as His Highness the Father Emir. Sheikh Tamim bin Hamad Al Thani is the current Emir of Qatar. He is the fourth son of the previous Emir, Hamad bin Khalifa Al Thani. Tamim has held a variety of government posts within Qatar and also worked to promote numerous sporting events within the country. As of 2018, Tamim is the youngest reigning monarch among the GCC countries and the youngest current sovereign worldwide. Sheikh Hamad bin Jassim bin Jaber bin Mohammed bin Thani Al Thani is a Qatari politician. 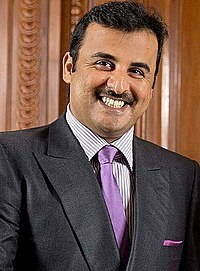 He was the Prime Minister of Qatar from 3 April 2007 to 26 June 2013, and foreign minister from 11 January 1992 to 26 June 2013. Sheikh Ahmad bin Ali bin Abdullah bin Jassim bin Mohammed Al Thani,, also known as Sheikh Ahmad bin Ali Al Thani for short, was the Emir of Qatar who ruled from 1960 to 1972. Qatar's financial status witnessed significant improvements during his reign as a result of the enrichment and discovery of several new oil fields. Qatar also gained its independence as a sovereign state in September 1971 under his rule. He was deposed in February 1972 by his cousin, Khalifa bin Hamad Al Thani. Sheikh Abdullah bin Nasser bin Khalifa Al Thani is a Qatari politician who has been Prime Minister of Qatar since 26 June 2013. A member of the ruling family, he was Minister of State for Internal Affairs from 2005 to 2013. Sheikh Joaan bin Hamad bin Khalifa Al-Thani is a close member of Royal House of Thani. He is the fifth son of former Emir of Qatar, Sheikh Hamad bin Khalifa Al Thani, and the third child of the Emir with his second wife, Sheikha Moza bint Nasser Al Missned.